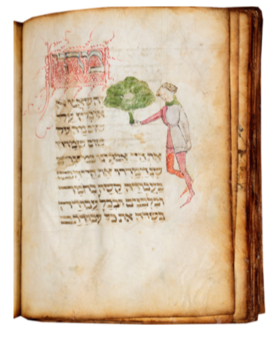 New York — For Passover, Les Enluminures presents a series of events that center on a remarkable medieval manuscript: a Haggadah with seventy-five watercolor paintings created in the circle of the famous artist Giovannino de Grassi (d. 1398) in Milan in the late fourteenth century. Telling the story of the flight of the Jews from Egypt based on the biblical book of Exodus, the Haggadah was - and still is - used during the Seder, the ritual meal of the first night of Passover. Its text has been richly illustrated by many artists in different countries for over seven hundred years. With its seventy-five illustrations, occupying the margins of almost every page, this manuscript expresses the elegant language of the Gothic International style in Lombardy. Directly related to the workshop of the renowned master builder, sculptor, and illuminator Giovannino de Grassi, who flourished under the patronage of the noble Visconti family in Milan, the present volume was probably commissioned by a wealthy Jewish individual. The presumed date of origin of the Lombard Haggadah corresponds with a period known for its wave of immigration into Lombardy of northern European Jews, who were especially welcomed by Duke Gian Galeazzo Visconti. Last on public exhibit in the Paris World's Fair in 1900, when it belonged to a French family, the Lombard Haggadah was then sold in 1927 in London to the noted collector of Hebrew manuscripts Zalman Schocken. Little known, the manuscript has remained in private hands ever since. It survives as the earliest stand-alone Italian Haggadah. Of the greatest rarity, it is one of three illustrated medieval Haggadot still privately owned. It is for sale. Sharon Liberman Mintz, Curator of Jewish Art, The Jewish Theological Seminary, states "I have worked with Hebrew illuminated manu- scripts all of my professional life, and this one stands out for its fresh, charming, and sometimes unique paintings as well as its historical importance." Founded by Dr. Sandra Hindman more than twenty-five years ago and with locations in Paris, Chicago, and New York, Les Enluminures has forged long-standing relationships with major museums and prestigious private collections throughout the world. It exhibits at TEFAF Maas- tricht, TEFAF New York, Masterpiece, and Frieze Masters. The gallery is well-known for the level of its scholarship evident in its numerous publications but also for the diversity, high quality, and provenance of the works it offers for sale. "I am honored to be involved in a project of such magnitude prompted by this rare and stunning work of art," says Sandra Hindman. "Hebrew manuscript illumination is a field that has always held great interest and attraction for me. I confess to being thoroughly enchanted by the present manuscript." For the first time in more than one hundred years, the manuscript will be on view for a limited period only in the New York gallery of Les Enluminures. Authors are: Milvia Bollati, Catholic University of Milan; Marc Michael Epstein, Vassar College; Flora Cassen, University of North Carolina, Chapel Hill; and Laura Light, Independent Scholar, Boston, Massachusetts. Introduction by Christopher de Hamel, Preface by Sharon Mintz. A full prospectus of the publication is available on request . Jewish Studies, Medieval Studies, and the Department of Art History and Music of Fordham University and Les Enluminures co-sponsor a series of events for Passover. Adam Cohen, University of Toronto, "Social and Sacred in the Medieval Haggadah"
Morning and Afternoon Sessions on "Patronage and Collection" (morning) and "Making Hebrew Manuscripts" (afternoon) . Speakers include Evelyn Cohen, Marc Michael Epstein, Barbara Wolff, and many others. Full program available on request. Image: The Lombard Haggadah, Milan, c. 1390-1400, Circle of Giovannino de Grassi (Master of the Paris Tacuinum? ), f.25v, Man holding a large bunch of maror [bitter herbs), illustrating the text "This maror."